I was part of the Deltares Indonesia team and worked as a Young Expert in operational water management. 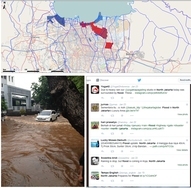 My responsibilities were developing a real time information system in flood and water management across the country. I also contributed in research regarding water management issues and I assisted local counterparts which entailed working with real time information topics. Being part of operational water management was exciting, we should be aware when floods are coming, be ready to get dirty and dealing with people who are stakeholders in flood disasters.